From left are Sgt. 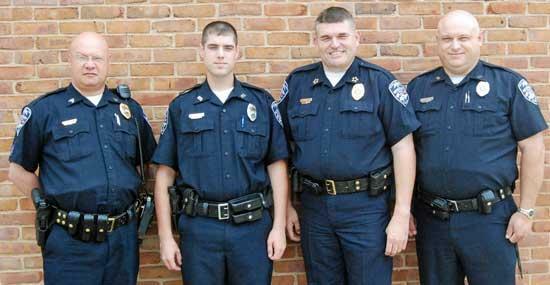 Kevin Mooneyham, Officer Chris Brown, Chief Tony Burnett, and Officer Lowell Womack. Chris is a resident of Cannon County and is the son of Danny and Rhonda Brown. Chris is also a Senior at MTSU where his major is Criminal Justice. Chris has been a reserve officer for the department since 2007 and also completed his college internship with the department. "We are very proud to have Chris on board. I feel he will be an asset in several areas," Woodbury Chief of Police Tony Burnett said. Present for the graduation along with Chris' family were Sgt. Kevin Mooneyham, Chief Tony Burnett, and Officer Lowell Womack.